Inn restaurant, and the America Gardens Amphitheater. and the Cantina de San Angel restaurant. Weinkeller shop, and the Der Teddybär shop. Alfredo di Roma Ristorante restaurant. restaurant, and the Mitsukoshi Restaurant. restaurant, and the Au Petit Cafe restaurant. Vision 360 film Wonders of China. Mercantile Trading Post shop and Le Cellier restaurant. Make the World Go 'Round film. The EPCOT Earth Station Film. the help of science fiction writer Ray Bradbury. featuring the FutureCom display, sponsored by Bell. Computer Revue show in EPCOT Computer Control. film Symbiosis, and the Good Turn Restaurant. Theater showing the 3-D film Magic Journeys. To all who come to this place of Joy, Hope and Friendship - Welcome. EPCOT is inspired by Walt Disney's creative vision. shape a world that offers hope to people everywhere. Kingdom first - and he died 5 years before its opening day. 20th century - in particular the 1939 New York World's Fair. explore the whole world ... in just one day! access to guests staying in Epcot resort area hotels. before the park's official dedication). nation represented in World Showcase are among your hosts making this a true international exchange." displaying Spaceship Earth and the text "The dawn of a new Disney era." 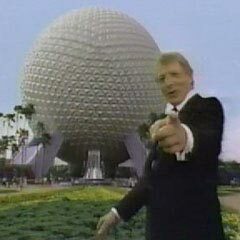 Spaceship Earth was dedicated on that day. and VIPs, and top executives from the corporations that sponsored attractions. path that leads to the Land. camera crews and invited broadcast stations to send reporters and producers.